What an absolutely gorgeous meal! Sorry, I had to cut straight to the chase there. Well actually, more straight to the attack :) Most Londoners who enjoy seafood have probably already been to this gem. I've only recently chosen to stop being vegetarian, and have discovered a great love for seafood, so this meal was an absolute treat. We started off with some French Albarino, oysters and scallops. 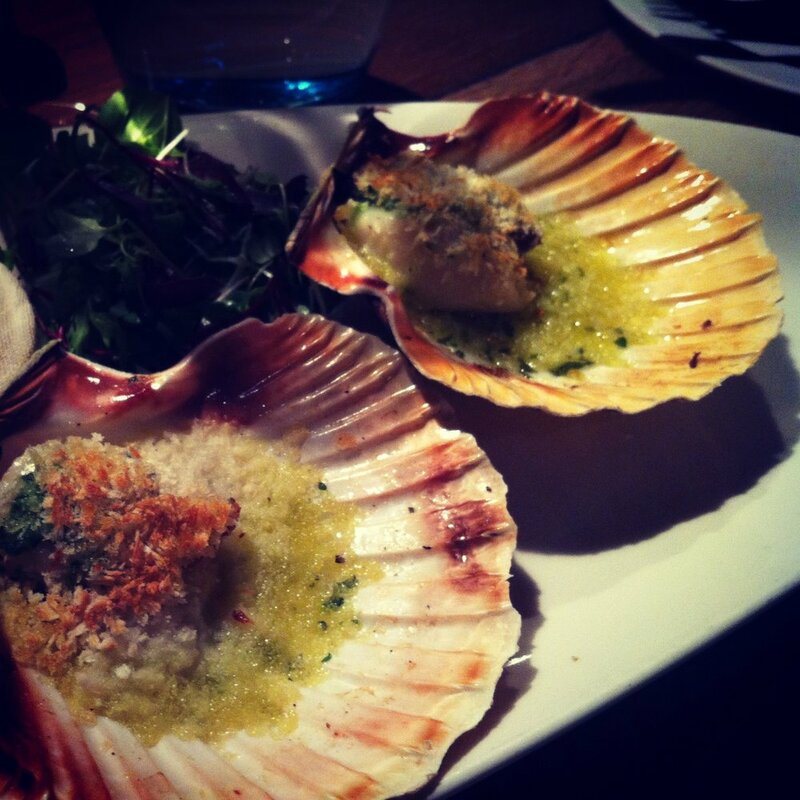 The scallops at Fishworks are hand dived from the South Coast and grilled with garlic butter, white wine and breadcrumbs. Perfectly plump and tender, but firm and meaty when I cut them, they were a delight. And when that garlic butter hit me with those crispy crumbs, it made me sigh happily. My mouth's watering just remembering them! Now I've never eaten oysters before, so I wasn't sure what to expect. I've been curious, but a little put off by how slimy they appear, but here I was at a restaurant exclusively devoted to seafood, and it was an opportunity I couldn't miss. So a couple of Devon rock oysters were ordered, and after a longish spot of deliberation about whether I should swallow them down or chew them first, I decided a bit of chewing wouldn't hurt (besides I was a little concerned they'd get stuck in my throat). The verdict: I could taste the sea in them, which was quite something! But towards the end, it got a bit too raw-meaty for me...I think I'd like to try them a little cooked first next time. Starters done, it was time for my oven roasted hake steak with spinach and hollandaise. 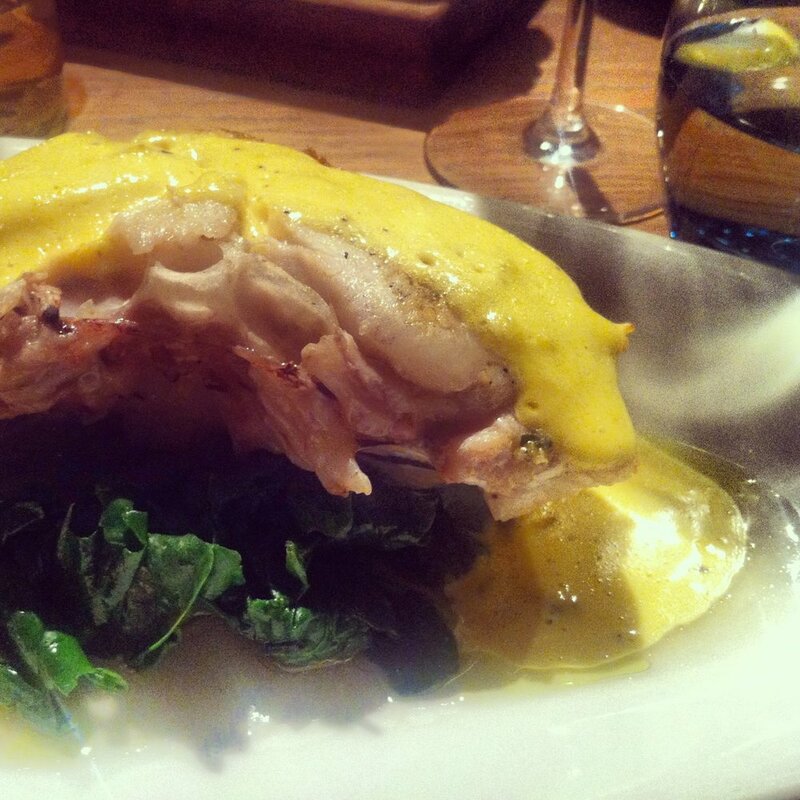 Soft flaky deliciously juicy hake, creamy hollandaise, and gently sautéed spinach. Every bite made my tastebuds sing, and I do not exaggerate when I say that! I have no idea how I had place for dessert after that, but I did. Stem ginger and treacle sponge with toffee sauce and vanilla icecream. Hot, crumbly and gooey. A beautiful end to an exceptionally good meal.